Jules Verne, the European Space Agency's new Automated Transfer Vehicle, lifted off successfully today. 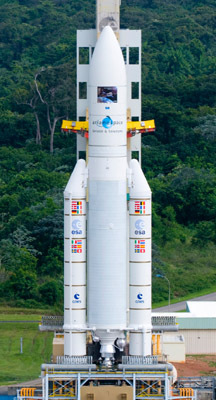 The Ariane 5ES rocket, which was making its maiden flight, lifted off from ELA-3 at the Guiana Space Centre at 04:03:04 GMT this morning. The ATV is carrying eight tons of wet and dry cargo for the International Space Station. Prior to making a rendezvous with the space station, the ATV will spend several weeks in a calibration and testing mode. It will then spend about a week catching up with the ISS and then "park" about 1200 miles away to wait until after the space shuttle Endeavour comes and goes from its own mission before attempting its own autonomous docking. The autonomous docking process will be accomplished with the aid of two new laser sensing systems that will pinpoint the ISS for docking. 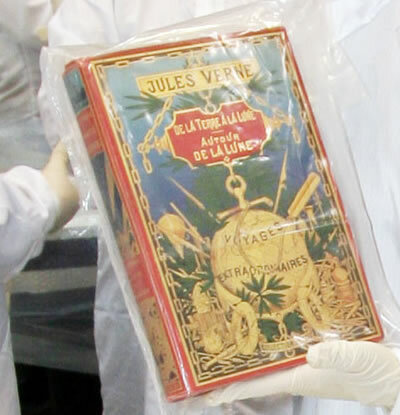 The Jules Verne ATV has a few special commemorative items on board, including a copy of "De la Terre à la Lune and Autour de la Lune" published during Verne's lifetime. (Copy of "De la Terre à la Lune and Autour de la Lune"
Check out this video of the launch of the Jules Verne ATV; very nice video also demonstrates how the ATV is transported to the launch pad. The most impressive feature of the Jules Verne Automated Transfer Vehicle is that it doesn't waste any space or resources on a pilot and crew. 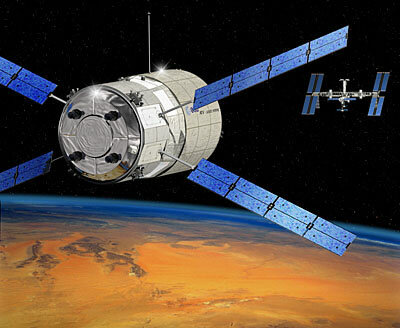 The ATV will dock with the ISS in a completely autonomous mode. The ISS crew will have a "red button" to push if they think that the ATV is misbehaving. 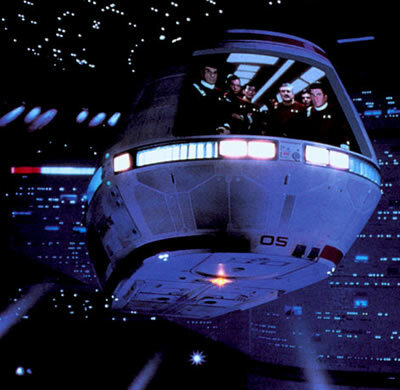 I don't know who first thought of the idea of a completely autonomous take-off and docking process; here's a nice shot of the automated transfer pod from the movie Star Trek IV: The Voyage Home. It performed a picture-perfect automatic docking. Read more at Europe's 'Jules Verne' Spacecraft Carries Author's Notes on Maiden Voyage and the Jule's Verne Automated Transfer Vehicle (ATV) ESA home page. Fiorello Bodoni, you inspire all of us. 'Whoever launched it fired a laser cannon... for about forty-five years, so the intruder would have a beam to travel on...'- Niven/Pournelle, 1974. 'They were more airplane than spaceship...'- Robert Heinlein, 1951.